The book develops and refines the key productive skills of writing and speaking in real-life contexts. It provides guidelines and models to enable you to manage your tasks more effectively and efficiently in English. Further, it highlights the underlying structural differences between communicating professionally in German and in English e.g, directness versus indirectness.- What?s in it? The focus is on best practice in a variety of business-oriented scenarios, from how to write effective emails and letters, reports, and promotional copy to how to give presentations with impact, influence people, give and receive feedback, and deal with complaints tactfully.- How do you use it? The book is for you to dip in and outof to help you refine your business skills. Look for the topic you need in the Contents and then you?ll find best-practice guidelines, examples and exercises with a key.- Why use this book? It?s written by native English business practitioners and only contains authentic materials. It?s practical, easy-to-use, and up-to-date.English is the international language of business and companies increasingly expect their employees, especially secretaries and PAs, to deal competently with business partners from foreign countries. The book develops and refines the key productive skills of writing and speaking in real-life contexts. It provides guidelines, models, and exercises to enable you to manage your tasks more effectively and efficiently in English. It?s written by native English business practitioners and contains only authentic materials. The book is compact and presents situations that are instantly recognisable to today?s executive secretary. It?s also practical, easy-to-use, and up-to-date. §Designed primarily for PAs, secretaries, management assistants, and support staff, it?s equally useful for a much wider range of people who need to do business internationally in English. You will draw the most benefit from this book if your English is of an intermediate level or above. The focus is on best practice in a variety of business-oriented scenarios, and, in addition, certain key linguistic areas which can be problematic for non-native speakers are reviewed in greater depth. There are also Appendices which provide overviews of for example, linking words and proofreader?s marks, and are intended as a reference.§Contents include:§? writing effective emails§? handling complaints tactfully§? giving and receiving feedback§? writing proposals and reports§? giving presentations§? influencing strategies and tactics§? dealing with difficult people§? saying ?no? 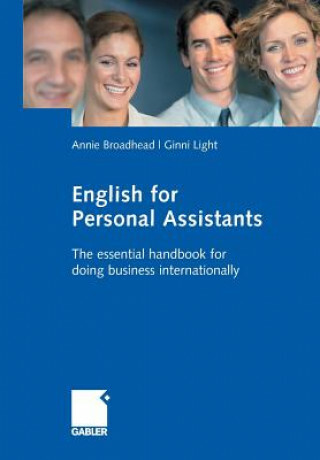 politely and assertively§Annie Broadhead is an English language teacher in Cambridge and examiner at the University of Cambridge.§Ginni Light is a trainer in language, communication, and intercultural skills for major companies across Europe. §They have both published numerous books on English as the international language of business.